A smattering of items from my conference tote bag. Lots of good stuff to read, ponder, and snack on! 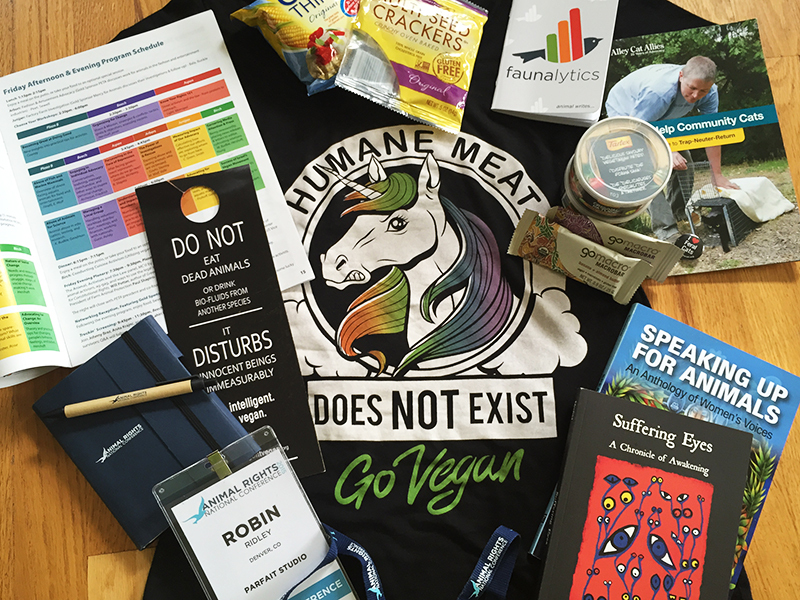 Despite the fact that I’m a long-time animal advocate, vegetarian, and (more recently) vegan activist, the Animal Rights National Conference was never on my radar. It seemed — like many things do when we scratch the surface — too overwhelming to consider. Hundreds of activists, dozens of sessions, four full days of workshops, plenaries, film screenings, exhibits…and, of course, oodles of networking. Still, when it popped up in my news feed late last year, I felt sure I should attend. I’d collaborated remotely with several of the event speakers, and I was eager to meet them in person. Plus, I figured my own approach to advocacy could use a thorough overhaul. What better place to accomplish all of the above? Registration complete, ticket booked. I highly respect these activists and there’s nothing like putting a friendly face to a well-known name. Colleen Holland, Robert Grillo, Lisa Kemmerer, Jo-Anne McArthur, Victoria Moran, and Andy Tabar were all extremely generous with their time, and I’m so happy to have connected with each of them. The knowledge that I was among throngs of likeminded folks, most of whom already felt like friends, was instantly empowering. The 2015 conference boasted record-setting attendance and was the ideal opportunity to “recharge our batteries,” as FARM’s inspiring founder, Alex Hershaft, instructed. It felt a little like walking into a greenhouse and inhaling pure oxygen through every pore. Much-needed and long overdue. Exercise, get outside, and make those all-important connections with other people. FARM’s executive director, Michael Webermann, actually suggested skipping a talk or two if it meant we’d have more energy for networking later in the evening. I generally attended between three and five events a day, which was more than enough for me. Sitting through session after session allows no time for mentally and emotionally processing the huge amount of information you’re receiving, and can lead to exhaustion. Be your own advocate and set limits to make the most of your time! First off, this isn’t a complaint. FARM flawlessly organized the conference and engaged several donors to provide free morning and evening snacks, which were delightful and quickly consumed by all. The hotel offered tasty vegan lunch and dinner buffets, but the prices were steep ($16 and $19, respectively), and not affordable for everyone in attendance. Having a stash of self-provided snacks and staples to keep in your room or grab from your bag as you dash between workshops is a lifesaver. That said, if FARM could persuade the hotel to provide a smoothie bar next year, they’d probably double their attendance…again! How often will you have the opportunity to rub shoulders with some of these incredible authors, speakers, and activists? Whether you want to ask a question, talk about a particular issue, or simply tell someone how much you admire their work, don’t hesitate to say hello. This goes doubly for meeting other attendees who may be feeling the same trepidation. Many of the new friendships I made started off with the ice-breaker, “So, what are the vegan food options like in [Wyoming, Canada, Mexico]?” Trust me, you’ll have plenty to talk about! 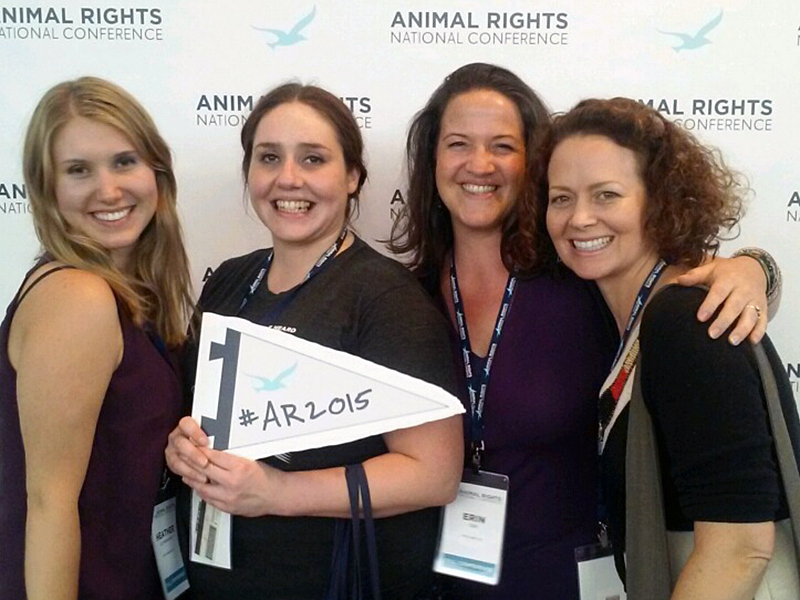 My final two cents: whether you’re an aspiring or established animal advocate, the Animal Rights National Conference is well worth your time. The range and quality of content continues to challenge and inspire me, and the connections and friendships I made during my four-day experience were priceless. I plan on attending again soon…with snack bag firmly in tow.